A lifetime ago, after graduating from university and teaching for a year, I had an opportunity to play hockey in Europe. It was 1985, a year after the XIV Olympic Winter Games in Sarajevo, and ice hockey was becoming very popular in the former Yugoslavia. Like countless former Canadian junior, university and minor pro level players, I had hoped to go over, play for a year and travel and see the continent. I ended up living for long stretches of 1985 to 1988 in Zagreb and enjoyed playing three memorable seasons for a team called the Medveščak Bears (Medveščak will join the well known Russian league, the K.H.L., for 2013-2014). It was a life changing experience. I was treated very well, got to play in front of thousands of boisterous, passionate and rowdy fans, live in a fascinating city during incredible times, travel Europe from England to Greece and almost every country in between, including several behind the “iron curtain” at the time, form some great some friendships and meet my wife, Andrea. Fast forward twenty-five years and we have established our lives in our beloved country of Canada. However, like many Canadians, our lives have been enriched by our cross-cultural experiences. We have two fantastic children who both speak Croatian (my Hrvatski is mostly limited to ordering hladno pivo) and we retain roots in the old country by way of a house on the Adriatic Sea where Andrea's mom (Baka Zdenka) lives six months a year. We have been back to visit a number of times and each time I learn to understand and love the place a little bit more. Croatia is no longer an unknown destination as most in the European Union (Croatia joined the E.U. 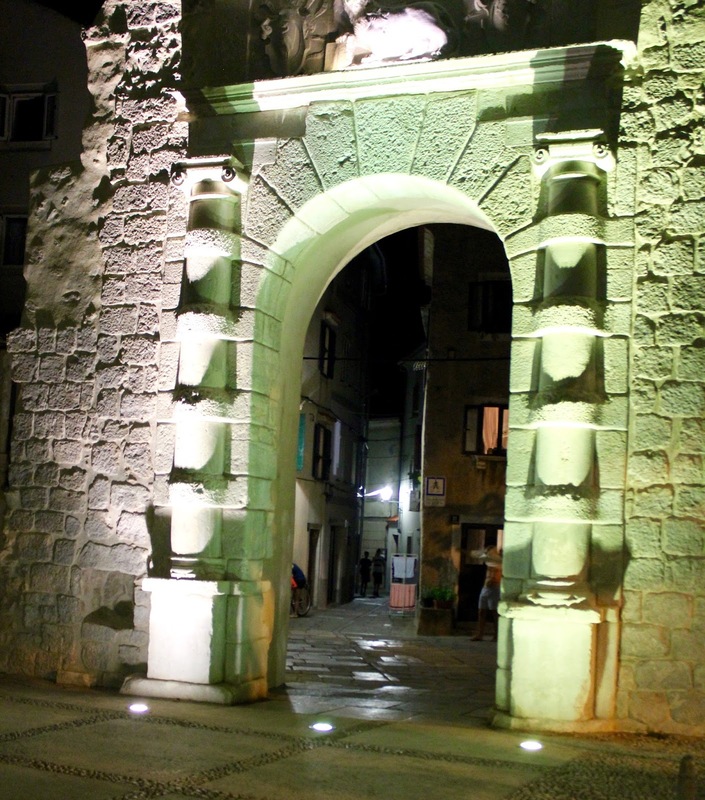 on July 1, 2013) are well aware of the magic of the Dalmatian coast along the pristine Adriatic Sea. Places like Dubrovnik, Hvar, Trogir, Split, Pula, Šibenek, Pag and the incredible sailing amongst the thousand small islands along the coast are increasingly well known all over the world. If you’re travelling to Europe in the future, I recommend a stop in Croatia. From my view, Croatians are rarely in a hurry. Living on the sea, this becomes even more evident. The temperature is typically in the low 30s from May through September and the pace of life reflects the heat. People do what they need to do, in the pace by which it will get done. If we need to have a break, eat a little, enjoy a coffee, a glass of wine or a cold beer, this is what we will do. Social interaction through getting together to drink something and talk is a normal part of every day life. 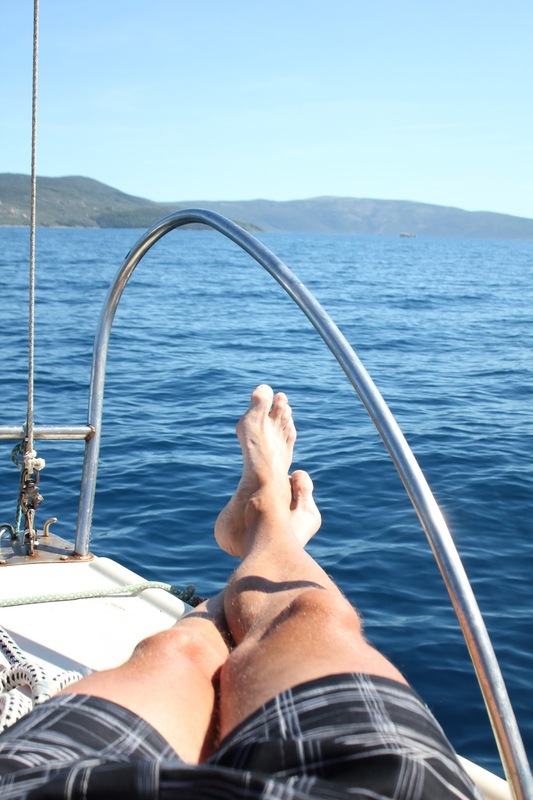 For someone like me, who has type-A, workaholic tendencies, every visit to Croatia is like therapy and this summer (2013) we enjoyed almost seven weeks on the Adriatic. Our small summer home is on the island of Cres (pronounced Sress; roll the r, and think Csar). Cres is a narrow archipelago accessible by a 30-minute ferry ride from the island of Krk, along the north part of the Croatian coast, just a little more than two hours from the capital city of Zagreb. Andrea’s father was an architect and he designed and built the unique, triangular shaped house in 1971 to avoid cutting down any of the indigenous trees on the lot. Surrounded by lavender, rosemary, grape vines and fir, olive, fig and plum trees, the home is situated on a hill, a few hundred steps from the sea and offers a spectacular view of the bay and the red tile roofs of nearby homes. Our home....sleeps 6....a couple more in a pinch. The morning view from our small second floor balcony. The same view each evening at sunset, still at least 25 degrees. The small town of Cres (population 2000) is a ten minute walk away. 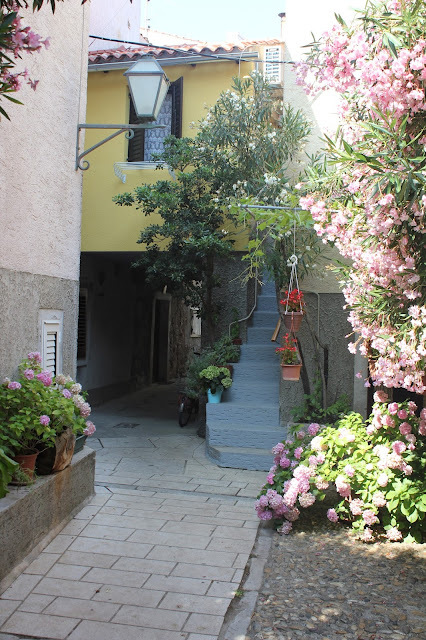 The old town was established before Roman rule (the Italian border is less than two hours away) and features narrow Venetian style, cobblestone streets, centuries old city walls and doors, piazzas and churches. Also nearby is the very modern ACI Cres marina, juxtaposing hundreds of large and luxurious yachts with the simple life of the local villagers. Indeed, contemporary Croatia is a blend of western-style marketing, shopping and modern freeways and small, simple villages and crumbling one-lane roads that meander down implausible slopes to the sea. Tower (Kula) in the old town...part of the 16th century city walls. Narrow old town streets in Cres. 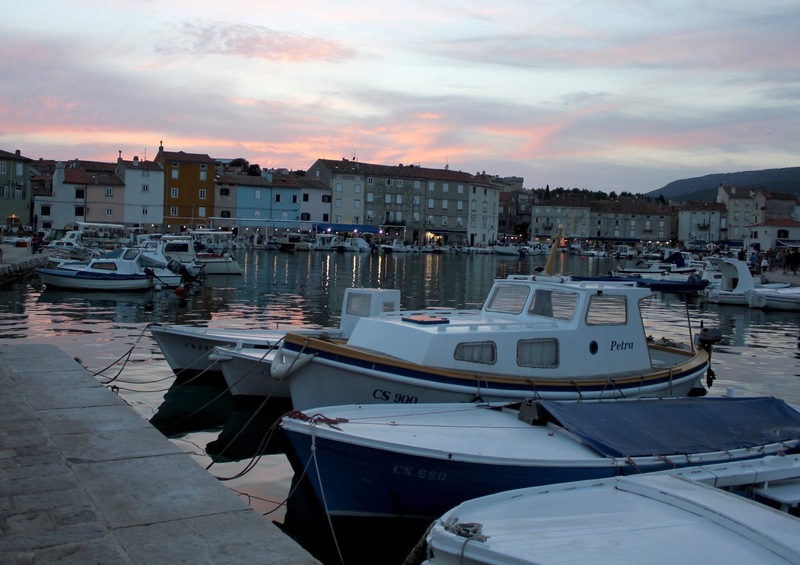 More of the old town of Cres on the inner harbour. Over 20 restaurants and cafes within 600 meters. Dry stone steps, walls and olive trees found all over the Croatian coast. Some shells discovered snorkelling just offshore at a nearby beach. Stone walls drop down into the sea - note the colour of the Adriatic! 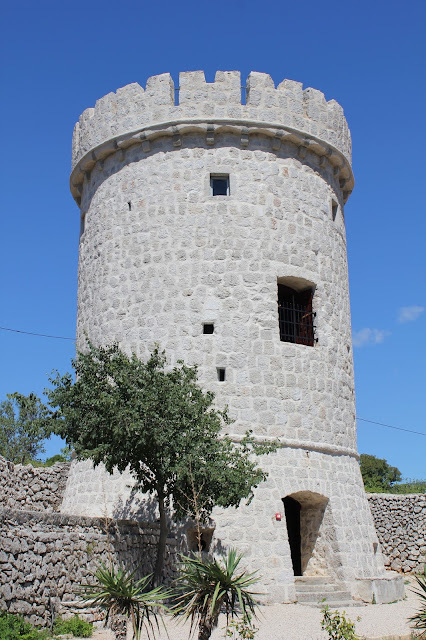 The island is home to internationally renowned olive oils (maslinovo ulje) and the undulating land is covered by ancient stone walls (suhozid) built without using mortar, that stretch from the sea to the highest points all over the island. The stone walls protect small terraces so that the rocky soil does not wash into the sea. The dry rock fences also help sheppard the sheep that are raised all over the island. Our days here follow a routine of getting up when we awaken, eating breakfast and deciding on which beach to visit on the day. The Adriatic Sea in Croatia is clean, clear and warm. The beaches are not the long sandy stretches people in North America are most familiar with, but rocky shorelines with crystal clear, warm water, ideal for swimming or snorkelling. We try to blend active days of hikes and bike rides with lazy days filled with reading and relaxing in the sun and swimming in the sea. The warm air, fresh breeze and clean sea make every day here a gift. 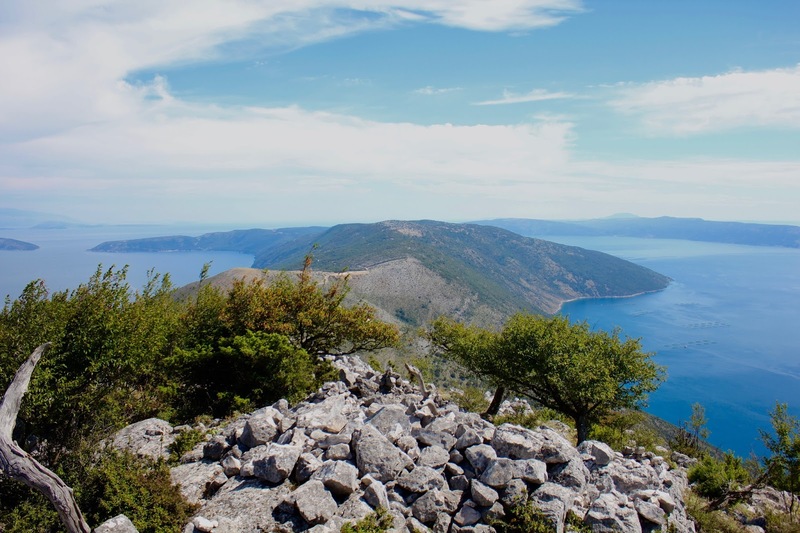 A great climbing hike near the tiny town of Beli shares beautiful views of the Island of Cres. From our home, it is quick walk to the sea and we can visit several of the local beaches or take a short drive to other small villages and countless beach areas on either side of the island. There are popular, crowded beaches with all the amenities but with a boat or a hike, one can readily find totally secluded spots to enjoy a quiet day by the sea as well. With a snorkel and mask, the visibility of the warm sea (25 degrees) is remarkable and many fishes, rocks and shells wait to be discovered. If you are lucky, as we were one day on a boat trip to a favourite beach, you may even see dolphins. We watched a pod of 20 dolphins for 15 minutes on this lucky day. A mom and her pup or calf. We always pack a lot of water to stay hydrated and fresh, local fruits, tomatoes, cheeses, prosciutto (pršut) and bread to snack on during the day. We head back in the late afternoon and jump in the outside shower – another simple but joyous routine on the warm island (we have a modern bathroom inside the house as well, but typically use only the toilet in the summer). We then prepare a dinner of fresh meat or fish (from the deli or fish market, and often cooked on the barbecue) with pasta or new potatoes, accompanied by a cold bean, mixed or tomato, onion and pepper salad and a cold beer or a glass of wine. There is also the option of wandering into town a little later to eat at one of the many outdoor restaurants, featuring freshly caught fish and other local specialties (fire roasted young pig or lamb) or thin crust pizza that would be the envy of any Italian. There is something about being outside all day that enhances your appetite and makes even simple, fresh meals incredibly enjoyable and delicious. Something for everyone on the grill: sausage, chicken, beef, čevapi and fresh fish. Dobar Tek! 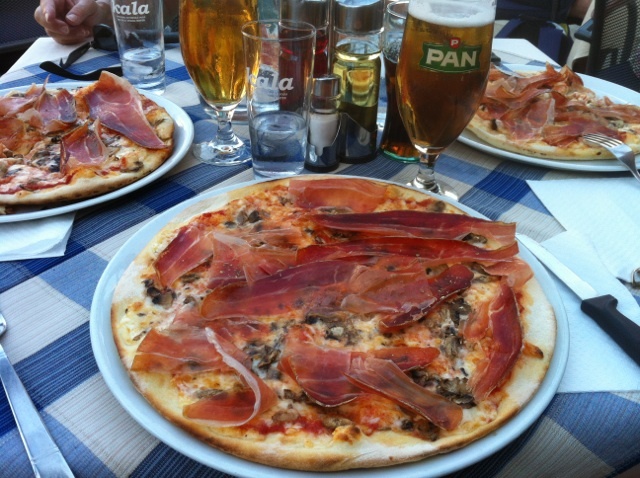 Pizza with prosciutto and mushrooms (pršut i gljive) - delicious! In the evening, it cools down slightly, but is often still in the low 20s overnight. We typically go for a long walk or run and then sit around our outside dining area and talk or play cards or a board game. Later, we may walk into town to enjoy a latte (bijela kava) or cappuccino or some delicious handmade ice cream (sladoled) or hot crepes (palačinke) with chocolate at one of the busy cafés along the waterfront. We rarely watch television and I do my best to avoid the lure of WiFi on most days. The next day, we do it all over again. It is a very good life. 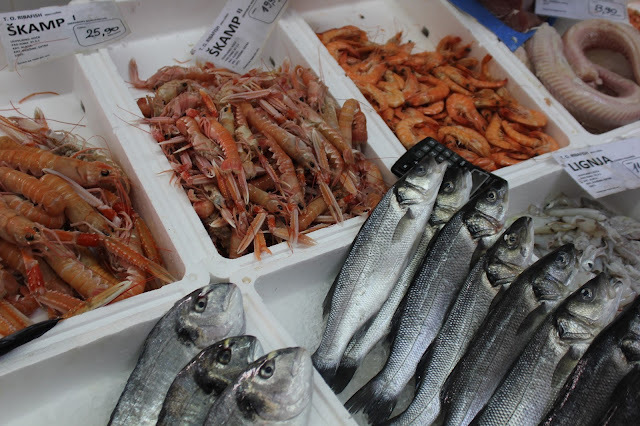 Some fresh local selections from the morning fish market in Cres. Relaxing on a boat cruise to a secluded beach. The view of the Bay of Cres, the modern marina in foreground and the old town in the background. Our home is in between. p.s. If the amateurish quality didn't give it away, with the exception of the map, all of the photographs were taken by me.